This barely deserves to be a blog post, but I can’t resist a brief critical appreciation of Stanley Fish’s second column on the digital humanities. Fish argues that digital humanists’ insistence on the networked character of human communication (or even human identity) makes them a) postmodern, b) theological, in the sense that they’re promising a transcendence of individual mortality, and c) political in an explicitly leftist way. In making these points, he cites about 2.5% of the people in my Twitter stream, which is one reason why I like the column. 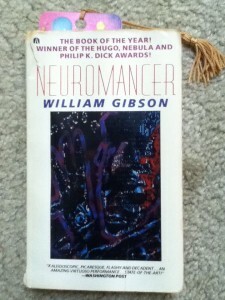 The cover of Neuromancer that I remember. I may not have copyright to this image, but file-sharing is part of my religion. The main reason I like it, though, is that it raises the bar for stylistic slipperiness in the pages of the NYT. Fish begins the column by posing as someone with a firm belief in the stability of the text, and in authorial identity. He says that he believes in these as strongly, in fact, as the critic Morris Zapp. This is pretty delicious, given that Zapp is a fictional character notoriously modeled on Stanley Fish. He can hardly function as an emblem of stable authorial identity … though he might well emblematize the immortal alter-ego that writing has always made possible. I’m reminded of the “laugh that wasn’t laughter” at the end of Neuromancer. Which brings me to the only place in the column where I do feel dissed. Fish thinks humanists promoting DH will be shocked by the notion that enthusiasm for the web involves a religious transcendence of mortality. Come on — we’ve read @GreatDismal. Moreover, a lot of us have read Emile Durkheim on the religious character of all social feeling, or Carl Becker on the Enlightenment’s secular faith in posterity. Just about all forms of reflection on history and writing promise a transcendence of individual identity. What’s more fun are the cases where they become religions in a socially concrete way — like the Swedish church of Kopimism, brought to my attention by James Dabbs, which makes the act of file-sharing its central sacrament. I enjoyed this column so much that I’m hoping the third installment (about digital analysis of “aesthetic works”) will be equally thoughtful and slippery. I’m rooting for Fish to resist the magnetic pull of formulations like “computers will never …” and “merely counting words can never ….” But those binary assumptions are hard to resist: I’m going to be wracked with suspense. UPDATE Jan 23rd. This really isn’t worth a blog post. But I should just briefly register my disappointment in Fish’s third column. It’s sophistry, and not even sophistry of an interesting kind. Once you say “excluded middle fallacy founded on willful misreading of two examples,” you’ve pretty much done all that needs to be done with it. Too bad. This entry was posted in impressionistic criticism by tedunderwood. Bookmark the permalink.